Takes about an hour and be gentle. If you do a good cleaning! This is what we are working with. 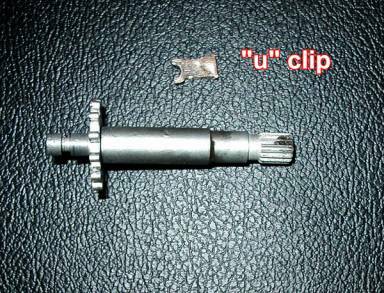 Only the crank shaft must be removed to replace gears. Look on the side of the unit where the crank shaft goes into the housing. You will see where the housing is crimped to hold in the “U” shaped keeper. 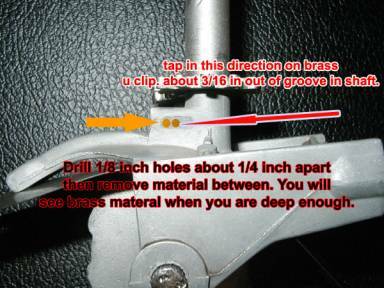 A 1/8 th inch pop rivet drill bit (short and less flex) will be used to remove a portion of the indent (very soft, drill two holes side by side and make a groove to remove material between holds)and a sharp punch to tap the “U” back about 3/16 inch. This will release the shaft. 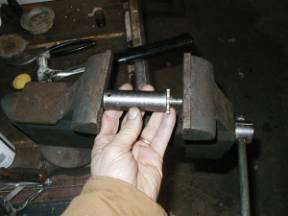 To remove the shaft gear use a deep well socket as needed over the long portion and press the gear off in vise. 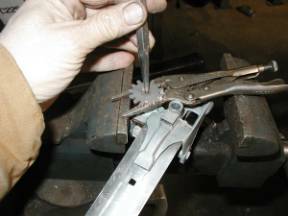 The gear still in the unit can be removed by needle nose vise grips, gently clipping under the gear so as the tips and handles of vise grips can span the vice jaws and center punch to tap out shaft with worm gear and housing. 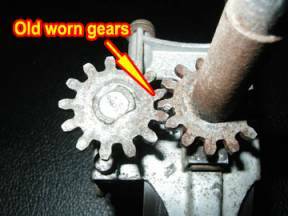 Do not remove worm gear shaft out of housing, not necessary and can cause problems. Now clean up every thing and lubricate. 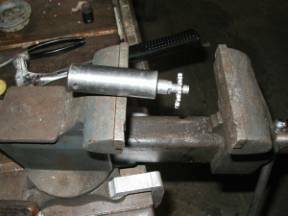 Use file to clean the burs and re-assemble using a press fit and weld of some sort. I used a mig , I tried the "weld epoxy" and it is not strong enough. One person even has drilled, tapped and used a machine screw. Picture above has too much material removed from side. Be careful. Also, I did not do this one. You can fill the hole drilled with some epoxy to hold the clip in place. 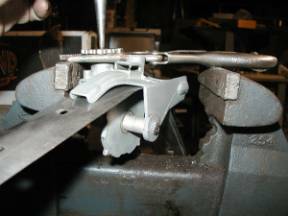 Backlash on gears will depend on wear of unit. Also remember, this regulator was not made to tolerances we expect today. This is pot metal and changes with age. I have built these gears for an average unit. If the gears seem tight or loose, They should still work, this is stainless and will not wear out. The unit in these instructions has a serious crack in housing. The back lash is about .010 to .015 and it still moves the tape very well. I have found that the finger that feeds the loose end is sometime bent upward. I recommend that you not try to bend it back. There is a notch in it toward the back of tape. Fabricate a plastic block to run on the tape. 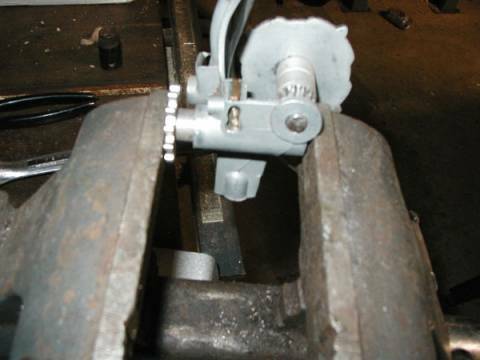 This will allow the large 4 toothed gear to fall in holes in stainless tape properly. The worm gear is another story. 60 degrees of play in handle is not bad (that is from 12:00 to 2:00 positions). 120 degrees will still work fine (12:00 to 4:00). After that it will require some work. Don’t throw it away. 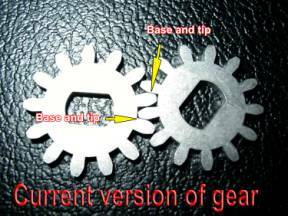 I am working on these worm gears. Shafts, Handles and Stainless tapes are in the works.